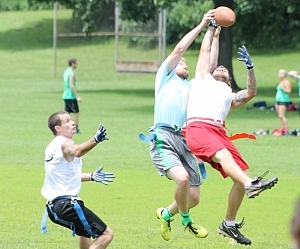 We are your headquarters for flag football in Madison. We run Spring and Fall outdoor leagues and Fall and Winter indoor leagues every year. Spring Leagues: Run approximately mid-April to mid-July. Co-ed games are played on Sundays, generally between 11 am and 4 pm. Men's league games are played on Monday nights from 6:30 - 9:30 pm. Fall Outdoor Leagues: Run approximately early August to mid-October. 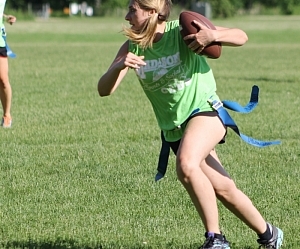 Co-ed games are played on Sundays - approximately 11:00 am to 2:00 pm before the NFL season starts, and approximately 9:00 am to noon once the NFL season has started. Men's league games are played on Monday nights from 6:30 - 9:30 pm. 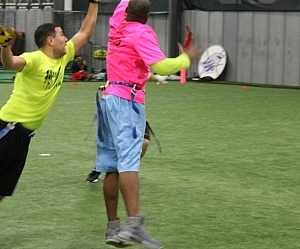 Late Fall/Winter Indoor Leagues: These are held indoors on a turf field. Dimensions are much smaller than our outdoor fields. The Fall indoor session starts in late October. The Winter indoor session starts in mid-January. Times tend to vary for these leagues. Don’t have a team? You can sign up as an Individual and MSSC will place you on a team if we can. Please see the information on Individual signups below. Don't have quite enough players for a team? You can indicate that you are looking for more players in the comments section during registration. Weekday leagues typically have a capacity that varies depending on which field(s) we are able to get. The Sunday league has no capacity and thus your team could play anytime between 11:00 am and 5:00 pm. If you are considering a weekday league, do not wait until the last minute to register if you want to play. Competitve: Teams of above average skill level who take the game seriously and want to win. Intermediate: Teams of average skill level who fall somewhere in between Rec and Competitive. Upper Rec: Teams who understand football and have some level of skill but would not fair well in the Intermediate division. This division awards no prizes. Lower Rec: Teams with very low skill or understanding of football strategy. This division awards no prizes. Men's: These leagues will be segmented into Competitive and Rec divisions if space allows and we have enough teams register in each division. Men: We typically are not able to place many males who register as Individuals in the co-ed league because most teams are not looking for additional males. Being placed as an Individual in one of our men's leagues is much easier since many times we can form a "Free Agent" team. Do not register for multiple leagues if you are not able to play in multiple leagues. We count on all free agents being available for any and all leagues for which they register. If you are able to play in multiple leagues but only want to play in one, please register for the league you prefer and indicate in the comments section that you would be able to play in other leagues.